Don’t let the 45% sugar scare you… This loaf is sooo gooood! This sugar loaf is traditionally made in the Dutch province of Friesland and very famous there. So it’s what we would call a ‘Fries suikerbrood’, Fryske Sûkerbôle in Frisian or Frisian sugar loaf. The recipe is my adaptation from the one I got from a local miller. Before you start making the actual sugar loaf, it is very important you make something I call a ‘sweetener’ or in other words, citrus zest rubbed in sugar. It’s very simple to make, but essential for the taste of the sugar loaf. Take the zest of 1 lemon and 1 orange (unwaxed, organic) and mix the zest with 40 grams of sugar. You can make more and make it in advance and store it in the fridge, it keeps very well. For this recipe you need 30 g of the sweetener. It is also used in things like stollen and raisin buns. Note: We use European flour which absorbs a few % less water /milk than American type flour. People using American type of flour should add 5-15 ml extra milk to the dough. If you use fresh yeast, dissolve it in the milk, instant yeast can be added to the flour. Make a dough using all the ingredients, leaving the sugar cubes and cinnamon out!, and adding the butter last, when the dough starts forming a ball. Knead until you have an elastic dough, about 8 minutes with a spiral mixer, with your hands it takes longer, about 15 minutes. Leave to rest in a covered bowl for 30 to 40 minutes. Make sure this is done in a room that has the right temperature (about 24ºC / 75ºF to 27ºC / 80ºF would be ideal). The 200 g of sugar lumps are broken into pieces by putting them in a towel and breaking them with a hammer (a very satisfying job). The pieces can be all different shapes and sizes. In the oven they will melt and caramelize in the loaf, giving the bread it’s distinctive look and taste. Now mix the sugar pieces with the ground cinnamon and carefully pinch them through the dough. You can leave most of the finer grit out of it, the bigger lumps and pieces are the most important to incorporate. When they are distributed evenly, carefully shape the dough into a ball, cover and leave to rest for 10 minutes. Now form the dough into a loaf shape. First make a rectangle and fold both ends left and right so the ends of the sides are only just overlapping ‘envelope style’, then roll it up. 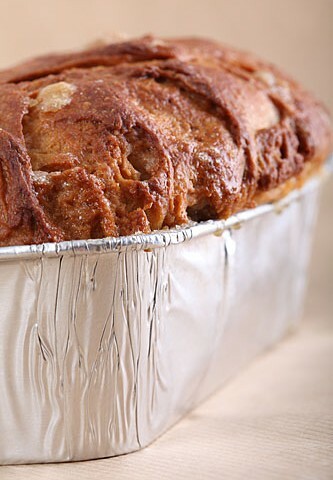 We use special aluminum tins for these loaves, but you can also use a bread pan or alternatively put the loaf on a baking sheet, (sugar will come out of the loaf and can drip on your oven floor so make sure this cannot happen!). Cover with greased cling film and let it prove for about 1 hour, again in a warm place. When you think the loaf has risen enough, use your floured finger to carefully make a very small dent in the dough. If the dent remains, the bread is ready to bake, if the indentation disappears, the dough needs a little bit more time. Preheat the oven at 200ºC / 390ºF. Bake the loaf for about 30 minutes, depending on your oven. Keep a close eye on it so the top will not burn (you can cover the top with alu foil if it browns too fast or turn the oven down a notch). Take it from the oven and do NOT touch the bread with your hands because the caramelized sugar is very HOT! But when it has cooled to just warm, be the first to taste it, with or without fresh dairy butter. So good! Dank Bart, voor je reactie. We horen heel graag hoe je desem-verie uitpakt. Dat hebben we zelf met dit recept nog nooit gedaan. Wellicht is een hydride versie met weinig gist en beetje desem ook nog een idee voor een ander smaakprofiel..
My bread didn’t rise? Did I do something wrong? Did you use fresh or instant yeast? Could it be the yeast was already older or past its sell by date? I am from Canada and am not familiar with “sugar lumps”..what are they and where in Canada would one purchase them? A more recognizable word would probably be sugar cubes, it is the same thing. I guess and hope you can find them in your supermarket. The only sugar loaf I’ve ever had is what I made from a recipe in Bernard Clayton’s Complete Book of Breads. I’d never heard of it before, but my father’s side of the family comes from that area and I had to try it. His recipe does have cinnamon but not the citrus zest. I had thought about trying some orange in it, so I have to try this recipe. Thank you for sharing the recipe! Hi Beth, sugar loafs mostly come from the dutch Frisian province and probably every town and bakery has its own version of a recipe. This is the one we like and works very nicely for use. My grandmother’s sister used to make a sugar bread but it didn’t have cinnamon in it. Is there a tradition that you are aware of doing this? They were from north Holland as well, just not as far north as Friesland, they were from Groeningen. I had never heard of this difference although it is common that there are regional variations. I tried to find information about the Groninger version of the sugar loaf but I cannot find anything. I did read that sugar loafs in Friesland were traditionally given when a girl was born. When I was growing up we used to go to Sylvan Lake, Alberta each year. I couldn’t wait as this is where we got our sugar loaf from the local baker. Over the years the bakery closed but now I love to make breads of many kinds. I have tried copying this bread with a little success but just not the same as my childhood days. It’s a shame that this recipe has gone but I am hopping that someone might know if it is still around. If anyone knows of this please get back to me. haha, i basically grew up in sylvan and i know the bakery your talking about. and definitely the sugar loaf, across from the cobbs. i don’t have the recipe but im on my final rise with this one and excited to try it. SCOTTE, DID IT TASTE THE SAME?!?!?! I’ve spent the last few years trying every sugar loaf recipe I can find to try to replicate the loaf from the Sylvan Lake Bakery. None compare. Hopefully this is the one! I’m trying it today. Try the sugar bread at Glamorgan bakery in Calgary, they only make it on specific days. I quadrupled this recipe because I want to give some away at Christmas. My grandfather used to make sugar loafs and ‘krentenwegge’ for the whole family every Christmas and since he isn’t here to do this anymore, I decided to carry on the tradition. Unfortunately his recipes are lost but I think this will be a great substitute. I kneaded the dough by hand (quite a workout!) because I don’t have a mixer and I like feeling the change in structure when the dough is coming together. This was a great dough to work with although it is a bit hard to get all that sugar in without the lumps falling out. The upside of kneading by hand is that I don’t really have to worry about the room temperature while proofing. The dough had a core temperature of 36C when I finished kneading. I can’t wait to see how they turn out and more important, how they taste! My grandfather was a baker and did everything by hand. Hard work, but you are very right about feeling the dough in your hands. Hope the recipe will turn out great and you can proudly continue your family tradition. Thanks Monica, so ‘tickled pink’ you like it! Hope it will turn out fabulous. Very good with fresh butter..probably because of the sugar..
Did you use a hammer :-)? thanks so much for sharing this recipe. i was planning on making sticky toffee pudding today, but your recipe made me long for this nostalgic sweet bread instead.